Today (and I guess that can mean literally on this date) it's hard to remember the time when "compassionate conservative" was the buzzword associated with George W. Bush. But that was his branding in 2000 when he ran for president, and it points to a difference between him and Rick Perry. Calling yourself a compassionate conservative was a pretty good move in 2000, and something like that would probably work today. Even if lots of people on the left didn't trust it, people on the center found it relatively easy to regard Bush as a moderate. 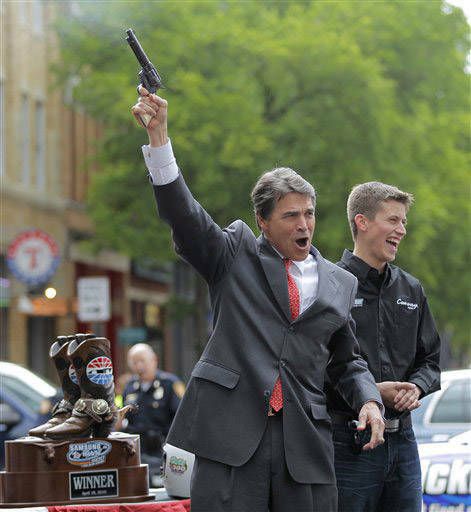 But nothing like it is going to be available to Rick Perry if he wins the GOP nomination. The kind of things he'll have to say to get there, and that he's already said in his book and on the stage, don't leave him much of a chance to look like a moderate. I agree with the general idea that economic factors determine election outcomes, but there are times when political positioning makes a difference. If Harry Reid could beat Sharron Angle by 7 points in a state with 14% unemployment, this kind of thing has to matter at least a little. Agreed. I'm surprised that the word "reckless" hasn't been affixed to him. Just look at that photo! I don't think anybody disputes that candidate quality and campaign performance matter to some degree. It's just that the extent of that degree is generally very small and is usually swamped by other factors such as the economy, any foreign policy messes, scandals, etc. But yeah Perry is pretty far out there, so maybe he'll be the exception that proves the rule.